Her margin is now bigger than the winning margins for John Kennedy and Richard Nixon. Hillary Clinton now leads the national popular vote for president by roughly one million votes, and her victory margin is expanding rapidly. That margin could easily double before the end of an arduous process of counting ballots, reviewing results, and reconciling numbers for an official total. But one thing is certain: Clinton’s win is unprecedented in the modern history of American presidential politics. And the numbers should focus attention on the democratic dysfunction that has been exposed. When a candidate who wins the popular vote does not take office, when a loser is instead installed in the White House, that is an issue. And it raises questions that must be addressed. Never has so big a popular-vote victory been trumped by the Electoral College. WHO WON THE NATIONAL POPULAR VOTE? AND BY HOW MUCH? Clinton is winning it. The only question now has to do with the size of the win. You will see different numbers in different counts because keeping on top of the national totals requires constant monitoring of the results from 50 states and the District of Columbia. The nonpartisan Cook Political Report maintains one of the most frequently updated spreadsheets on the race. One week after the election, it had Clinton with 62,403,269 votes to 61,242,652 for Trump. That puts Clinton ahead by 1.16 million votes. Another able chronicler of the count, Dave Leip’s Atlas of U.S. Presidential Elections, also puts Clinton ahead by more than one million votes. 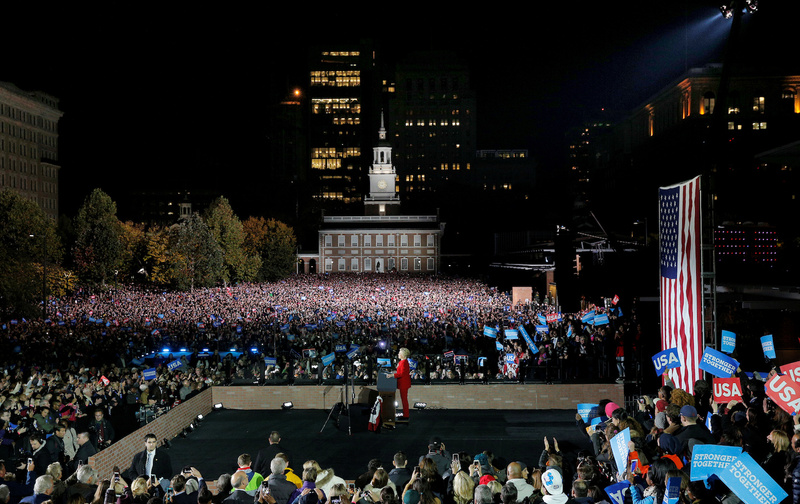 The million-vote figure is a baseline from which to analyze Clinton’s popular-vote victory. But it is only that—a baseline—as her margin will continue to expand. HOW COME NO ONE IS GOING OVER 50 PERCENT? The previous three US presidential elections saw the winning candidates win actual majorities of the popular vote. But that won’t happen this time. As in 18 previous presidential elections, the winner of the popular vote in this year’s election will achieve only a plurality of the votes. More than a million votes have already been counted for Libertarian Gary Johnson, Green Jill Stein, independent Evan McMullin and others, according to various counts. The totals for third-party, independent, and write-in candidates will rise as the tabulation continues—providing a powerful indication of the desire for a broader democracy and political alternatives. The high level of support for third-party and independent candidates also guarantees that neither major-party candidate will do this year what Barack Obama did in 2008 and 2012: win a majority of the popular vote. WHY AREN’T ALL THE VOTES COUNTED A WEEK AFTER THE ELECTION? The United States has no clear and consistent national standard for holding elections or for counting votes. The rules differ radically from state to state. In some states, election officials are already engaged on the process of establishing a final official count. In other states, ballots are still being counted. The big distinction is between states that do most of their voting on Election Day and states that rely heavily on “absentee” ballots and mail voting. It happens that many of the bigger states that make it easier to vote (at the polls and by mail) are states that favored Clinton. As on November 11, according to the state’s updated “Estimated Unprocessed Ballots” report, more than one million ballots were as yet uncounted in Los Angeles County. Two days later, San Diego County reported that it has more than 600,000 ballots to count. BUT THE HEADLINES JUST TALK ABOUT DONALD TRUMP WINNING? Elite media outlets do not, for the most part, have an interest in vote counts and what they mean. Coverage of the 2016 election campaign confirmed the extent to which major media are more interested in personalities than facts on the ground. The television networks like to declare a “winner” and then get focused on the palace intrigues surrounding a transition of power. Those intrigues are worth covering. But perspective on the will of the people get lost. Election-night numbers get locked in, and that’s that. There may be a notation that Clinton won “a narrow popular-vote” margin, but rarely is there a deep dive—even as the “narrow” margin grows to something much more substantial. It was announced on election night that the Republican nominee had secured a sufficient number of Electoral College votes to claim the presidency. With the counts continuing, and with recounts a possibility, the Electoral College totals as of one week after the election project that Trump will win 306 electoral votes, as opposed to 232 for Clinton. The Trump figure is 36 more than is needed to reach the 270 total that is required to claim the presidency. Trump will almost certainly stay above the 270 threshold, although he could still lose a state (such as Michigan, where he leads by less than 13,000 votes) or win one (such as New Hampshire, where Clinton is up by around 3,000 votes). The results in a number of battleground states were so close that a shift of around 55,000 votes in three states (Michigan, Pennsylvania, and Wisconsin) would align the national popular vote result with the Electoral College result for a Clinton win. What is important here is to recognize that there was no Trump mandate, in the popular vote (which he lost by a significant margin) or in the Electoral College (which he won narrowly, thanks to close results that tipped a handful of states in his favor). Notably, Trump’s total fell below 50 percent in the majority of states; he lost 20 states and the District of Columbia, and in at least seven additional states he leads, but without a majority of the vote. IS CLINTON’S POPULAR-VOTE VICTORY UNPRECEDENTED? Yes. Clinton has already won the popular vote by a dramatically larger number of ballots than anyone in history who did not go on to be inaugurated as president. There have been cases in the past where popular-vote winners have not become president. Three of them occurred in the 19th century, before the majority of Americans were allowed to vote. Before this year, there was only one instance in the modern era when a popular-vote winner was denied the presidency by the Electoral College. That was in 2000, when Democrat Al Gore beat Republican George W. Bush by 543,816 votes nationally. Clinton’s popular-vote margin over that of Trump is now greater than that of Richard Nixon over Hubert Humphrey in 1968, and that of John Kennedy over Nixon in 1960. Clinton is now winning roughly 47.8 percent of the vote, according to David Wasserman’s count for the Cook report. That’s a little less than the level reached by Gore in 2000. As Clinton’s popular-vote margin increases, so, too, will her percentage. It is possible that she will win the popular vote with the highest percentage of anyone who has not taken office. But the percentage that matters is Trump’s. The Republican nominee will become president with less popular support than a number of major-party candidates who lost races for the presidency. Trump is now at 47.0 percent of the popular vote, according to the Cook count. That is a lower percentage than were won by Mitt Romney in 2012, John Kerry in 2004, Gore in 2000, or Gerald Ford in 1976. IS THIS ABOUT HILLARY CLINTON AND DONALD TRUMP? No. Supporters of Clinton and critics of Clinton can kvetch about the virtues of her candidacy, and about what remains of the Democratic Party, for as long as their voices hold out. And Trump supporters can certainly announce that “the rules are the rules.” But this is about a higher principle than partisanship, and about something that matters more than personalities. This is about democracy itself. When the winner of an election does not take office, and when the loser does, we have evidence of a system that is structurally rigged. Those who favor a rigged system can defend it—and make empty arguments about small states versus big states that neglect the fact that many of the country’s smallest states (Delaware, Hawaii, New Hampshire, Rhode Island, and Vermont) backed the popular-vote winner. But those who favor democracy ought to join their voices in support of reform. There is also the bipartisan National Popular Vote initiative. Promoted by the reform group FairVote, it commits states to respect the national popular vote (as part of a multi-state compact in which states with a majority of electoral votes commit to assign them to the candidate who gets the most votes) and to ending the absurdity of elections in which losers can become presidents. IF SOMEONE TELLS ME I SHOULD “GET OVER IT,” HOW SHOULD I RESPOND?